Warrenton, Va. (February 4, 2019) – Patriot Group International (PGI) was recognized by the International Stability Operations Association (ISOA) with a Corporate Achievement Award. The award honors companies who consistently demonstrate commitment to accountability, transparency, and ethics in the stability operations arena. 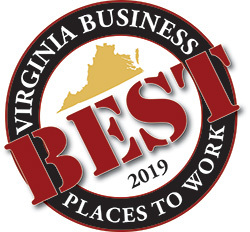 For the second year in a row, Patriot Group International (PGI) was named the third best company to work for in the 2019 Best Places to Work in Virginia, an annual list created by Virginia Business and Best Companies Group that recognizes the best employers in the Commonwealth. The statewide survey and awards program is designed to honor the best places of employment in Virginia, benefiting the state’s economy, workforce and businesses. The 2019 Best Places to Work in Virginia list is made up of 100 companies. Applicants were evaluated based upon their scores in workplace policies, practices, philosophy, systems, and demographics, and an employee survey to measure the employee experience. The final rankings were announced at an awards luncheon on February 1, 2019 at the Boar’s Head Inn in Charlottesville, VA and appear in the February 2019 issue of Virginia Business. For the full list, click here.